Someone has finally read our minds and created a ready made stencil cap! With this cap, you will no longer spend 15 minutes or more having to making your own from scratch- just pick up a few of these and you are set! These ready made stencil caps will give far more consistent and precise results than their home made cousins, too. 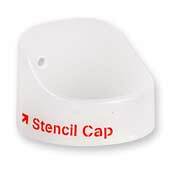 The stencil cap is used to create ultra thin lines by installing it on your spray can in front of the nozzle, effectively stopping the flow of most of the paint. The paint that makes it through the stencil cap creates lines which are far thinner than any spray cap available. Expert tip: things can get messy after a few uses, so keep a rag close by for easy clean up. 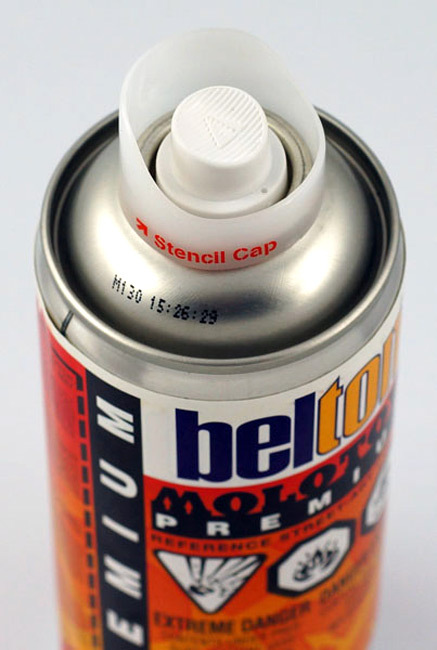 If you are using the Stencil Cap with Montana Gold, be sure to take the color indicator off of the can before use. This ensures that the cap is aligned properly with the hole of the Stencil Cap. The stencil Cap works like advertised and is OK.
-I can get thin lines for sure. -Fits snug on the end. - Difficult to take off. - You have to remove the Color Donut for it to work properly. This product was added to our catalog on Wednesday August 27, 2008.